Peaches take to the grill like fish to water. The quick cooking over live flames brings out their natural juiciness and intensifies their deep summer sweetness. Based on that description you might be inclined to think that throwing them on the grill would be a reasonable way to improve the flavor of less-than-perfect peaches. You would be fabulously correct. The fix-less-than-perfect-peaches effect gets intensified when you add the optional brown sugar and cinnamon. For the best results, start with peaches (any type will do!) that are firm with just a little give when you give them a gentle squeeze with your whole hand. Long story short, you want them to smell like peaches, especially if you sniff their stem end. Nine times out of ten, the better the aroma, the better the flavor. 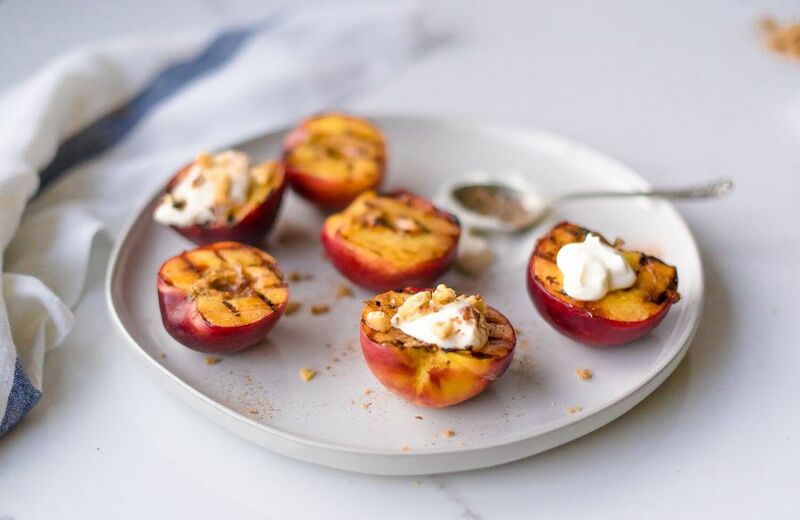 Serve grilled peaches as a side dish (they are particularly yummy alongside grilled pork) or in salads. Or turn them into a delicious dessert by pairing them with cool yogurt, whipped cream, or with scoops of ice cream. Prepare a gas or charcoal grill to medium heat: you should be able to hold your hand about an inch above the cooking grate for 3 to 4 seconds before pulling it away from the heat. If you have the grill going to cook something else that requires more heat, use the areas around the edges that are cooler for the peaches. Another tactic is to cook dinner, let the fire cool down, and then grill the peaches. Cut the peaches in half and pit them. If you want to add cinnamon and/or sugar, grill entire peach halves; otherwise, you can cut them into wedges, if you like. Peeling the peaches isn't necessary for the grill, but if you want to, you can. Lightly brush the peaches with the oil, being particularly aware of coating the cut sides well. Set the oiled peaches on the medium hot grill. They don't need a ton of room to cook up nicely but make sure they aren't touching so the hot air of the grill can encompass each piece. Cook the peaches until grill marks form, turning as necessary to mark all cut sides for the best presentation. Turn the peach halves over, sprinkle with the cinnamon and sugar, if using. Cook until the peaches are tender, but not falling apart, about 8 minutes total. Serve grilled peaches hot, warm, or even at room temperature. Mix up the fruit: Add some plums, pluots, or other orchard fruits to the grill—you can cook them the same. Use cardamom instead of cinnamon: It's a nice switch from the more common cinnamon. Create buttery richness: Add a pat of butter along with the brown sugar for even more of a glazed effect.